4/11/18 – Duey has found a home! Want someone who is always happy to see you? Someone who just wants to be with you and love you all the time? Then Duey’s your man! 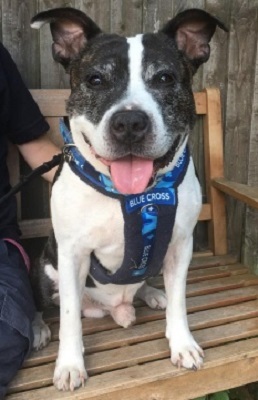 He is a 10-year-old Staffy boy who is seeking a new home through Blue Cross Hertfordshire. 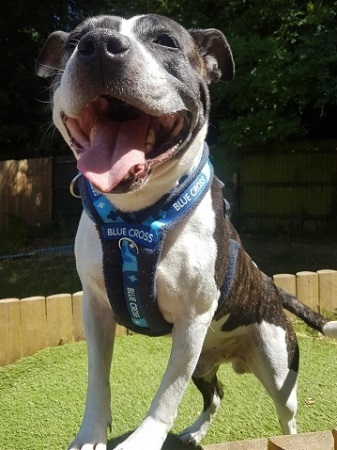 Duey is a handsome and infinitely huggable little dude who walks nicely on the lead and behaves beautifully around people. He only really needs to go for short strolls, but he enjoys them very much. He is fine to live with children of school age and will enhance any family with his loving and fun nature. 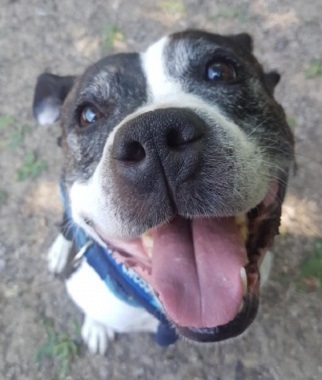 The love and loyalty of a Staffy are legendary. Duey offers this and much more. Please fill out the Home Finder form on their website. Please mention that you saw handsome Duey on the Oldies Club website.